Update: This feature is now available! Check out the latest release of Tableau. Earlier this year, we introduced Tableau Prep for self-service data preparation, allowing you to quickly and confidently combine, shape, and clean your data for analysis. The direct, visual experience gives you a deeper understanding of your data and the smart experiences make data prep easier and more accessible. Now we’re excited to announce Tableau Prep Conductor, a new add-on to Tableau Server and Tableau Online that enables organizations to schedule and manage self-service data prep at scale. Tableau Prep Conductor empowers you to schedule your flows to run in a centralized, scalable, and reliable server environment so your data is always up to date. It also gives administrators visibility into self-service data preparation across their organization. With Tableau Prep Conductor, they can manage, monitor, and secure their flows using their Tableau server environment. Tableau Prep Conductor is now available as part of the Tableau 2019.1 beta release. Using the power of Tableau Prep Conductor, you can now publish flows to your Tableau Server. From Tableau Prep desktop, simply select “Publish Flow” from the “Server” menu, and your flow will be available on Tableau Server where you can leverage its horsepower to run your flows in a scalable and reliable server environment. Tableau Prep Conductor allows you to schedule your flows to run when you need them. Automate the process of running flows and create a repeatable process, so there’s consistency in the delivery of prepped data. And to make things even easier, it integrates with all the existing scheduling capabilities in Tableau Server that you already know and love. With Tableau Prep Conductor, you can create a governed data prep environment. Build rules and permissions around data sharing and refreshes to align with your organization’s requirements. 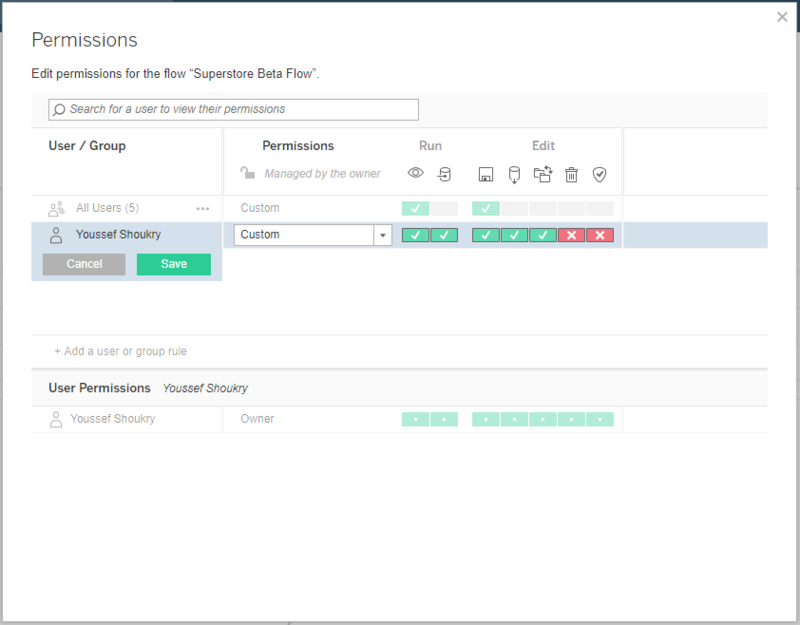 Prep Conductor takes advantage of the existing permissions model and infrastructure in Tableau Server, and extends it to control who can publish, view, and run flows. Tableau Prep Conductor provides you with a historical view of your flows' run history. See successful or failed runs at a glance so you know the quality of all your flows and have greater confidence in the accuracy of your data. And with out-of-the-box alerts, you’ll be notified if a flow fails so you can keep track of the quality of your data prep flows. Join the pre-release community to try the beta today and to engage with the Tableau development team through user research, product discussions, and feedback activities. Tableau Prep Conductor will be available as an add-on to Tableau Server and Tableau Online that is licensed separately. For more information about all the new capabilities in the Tableau 2019.1 beta release, read our blog post.